Built in 1928 for a lady (Miss Tozer) whose sister was a nun at the convent. Although a closed order the lady at Abbeylands felt comforted by the fact that although she was unable to make contact with her sister she knew she was living just across the road. Former name The Fernery. A house with a very long history and occupied by the Yarde family before they removed to Culver House in the early 1850s. Many of its former occupiers were in the medical profession. 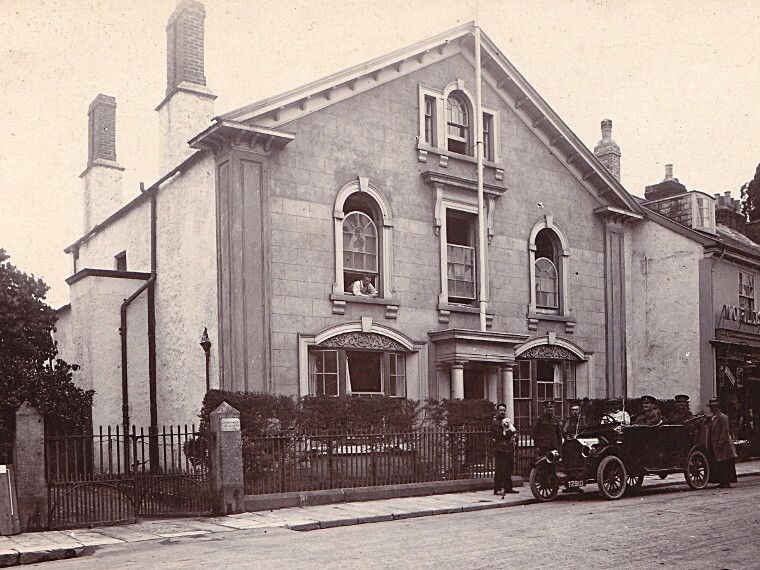 A Voluntary Aid Detachment (VAD) Hospital was housed here during World War One and a private house subsequently although for a time in the 1940s it housed a dairy (and ice cream parlour) and more recently (1970s) a downstairs room was used as the town library. Brockley House stood on the south corner of the junction of Oldway with Fore Street and was demolished in the early 1970s to create a much wider and safer junction of Oldway with Fore Street. 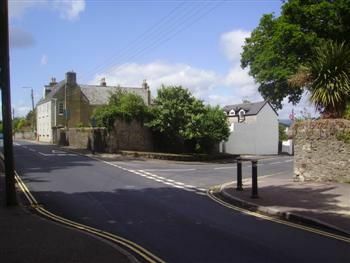 The house and its adjacent buildings had become vacant and so the council acquired the site for the road improvement scheme. Today much of its site is an open space against the high boundary wall of the Old Fairfield property. The substantial double-fronted property had bay windows at ground and first floor level and dormer windows above the bays. The central front door was covered by a small porch and the name Brockley House was written on the fanlight window above the door. Brockley House photograhed about 1950.
was built in the 1940s and called Brockley Cottage for a time. 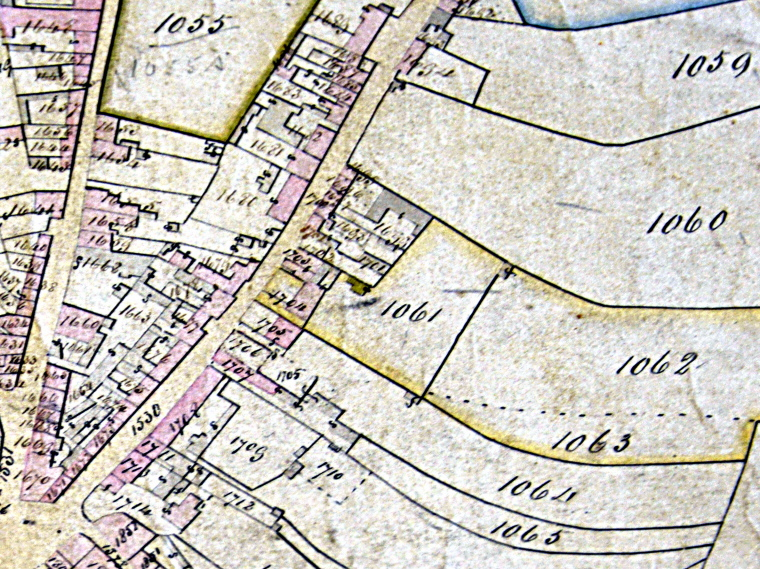 A dwelling had stood on the site at least as early as 1838 when the tithe map was drawn up and by the time of the 1841 census a house on the site was referred to as Berwick-on-Tweed. This name was used again in the 1851 census but disappeared from use within the next ten years. The owner of that property was a Richard Stamp, originally from Northumberland which likely explains the use of the name. He was connected with the Wright family of Hams Barton and as the second house on the site was erected by that family it seems reasonable to assume that on Richard Stamp's death in 1848 the property passed to the Wright's. 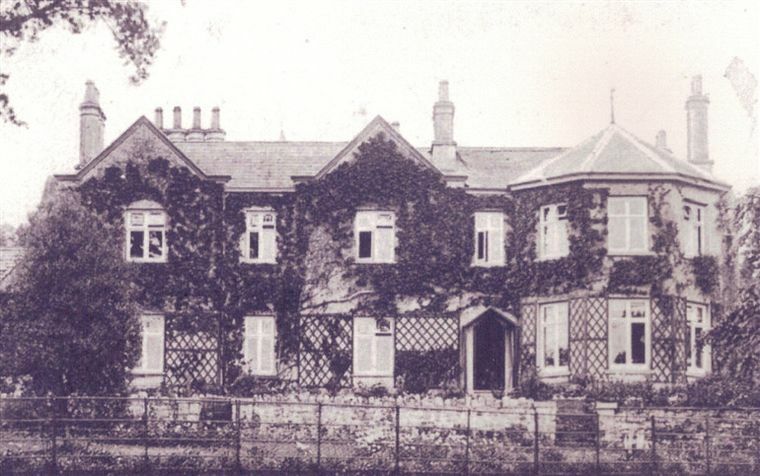 It is likely that Brockley House evolved out of that former property and was given the name by its then owner, William Wright who had come to the house by 1891. He had relatives at Brockley, London and this is how the name came into use. GROUND FLOOR – 2 Reception Rooms, Kitchen and convenient offices. FIRST FLOOR – 3 Bedrooms and w.c.
TOP FLOOR – 2 Bedrooms and Roomy Landing. AT THE REAR – Scullery, Back Kitchen, w.c. (under cover), and Coal, Large Wash-house with Copper, etc. Considerable frontage on Side Road, Also Garden and Garage space. Rates about £6 6s. per annum. Ideal for Bed and Breakfast House. On Main Plymouth Road. All Main Services. In good structural repair throughout. For Further Particulars and Orders to View, apply to Messrs. Gilbert H. Stephens & Sons, Solicitors, 17 Southernhay East, Exeter, or to the Auctioneers, 25 Queen Street, Exeter. The house was bought by the Caunter family and remained with them until demolition the early 1970s. The open space and wider entrance to Oldway created sfter the demolition of Brockley House. A mini-roundabout was initially considered but this never materialised. Built about 1817/18, originally as Coburg Cottage for Mr Joseph Barnes, originally of Tisbury, Wiltshire. To be let, a neat new built house, called Coburg Cottage, pleasantly situated within a few minutes walk of the town of Chudleigh, Devon; and about half a mile from the River Teign; consisting of a parlour 15 feet by 14, drawing-room 16 by 15, a good store-room, kitchen and back-kitchen, with a pump of excellent water, on the ground floor; four well-proportioned bed-chambers and dressing-closet, on the first floor; with convenient attics. A walled garden, and Land if required. Further particulars may be known of Joseph Barnes, of Chudleigh; and all post-paid letters will be duly answered. Joseph Barnes died in 1822 and was buried in the churchyard; his wife was still at the house in 1825 but moved away not long afterward. By 1830 a Capt. Rolfe was in residence, nothing is known of him and he had left again within a few years. By 1841 William and Ellen Rouse were in occupation, they stayed for about six years and moved out to Heathfield House on the Exeter Road. They were instrumental in staring the Baptist movement in the town. By 1848 the house was occupied by Henry Troubridge Wright and his wife Frances Concetta. Formerly of St John's Wood, London he was a man of independent means and had married Miss Franklin at Marylebone in 1840. Coming to Chudleigh with them were their four sons, a daughter was first-born in Chudleigh followed by a further five children over the next eleven years. Henry died in 1870 and is buried in the churchyard, his wife Frances in 1896. The house was then lived in by their two spinster daughters, Frances and Georgina who passed away in 1942 and 1951 respectively. Also returning to the house after the first war was their unmarried brother Major Arthur Frederick Wright who lived with them until his death in 1946, he was a very keen sportsman with a close involvement with the Chudleigh Cricket Club. His younger brother, Edward Fortescue Wright (born 11 March 1858) was also keen on cricket, joining Chudleigh CC as a youngster. He later played for Somerset and Gloucestershire before joining the Colonial Service in 1880. He moved first to British Guiana where he was Inspector of Police until 1899 then moving to Jamaica. At both places he continued his cricket playing and was highly regarded as a player. In April 1902 he was involved in riots at Montego Bay and recieved injuries from which he never fully recovered. For his actions he was awarded CMG in June 1902 but his poor health after the riots brought about his early death on 16 November 1904, he was aged 46. His funeral in Kingston the following day was attended by many dignitaries and the Governor of the island spoke very highly of him. Edward Fortescue Wright's eldest son, Cmdr. Arthur Edward Hext Wright RN (born 7 February 1886 Georgetown, British Guiana) came back to the house briefly in the late 1940s and lived there with his wife Alison until moving to the thatched cottage next door called 'Coburg Cottage'. Not long afterward they moved again to the adjacent house, called 'The Cottage' where he lived until his death in November 1970. He too had been a keen sportsman in his younger days, having had close links with Chudleigh CC and holding the chairman role for the 1953/54 season. By the late 1940s Coburg House had passed into the ownership of another ex-Navy man, Capt. Ronald Cunningham Wield CBE (1898-1981). Following his death his wife moved to the converted coach house in the grounds named Carrick Lodge. She shared that house with Ronald Wield's spinster sister, Elsie. New Exeter Street was formerly Culver Street. This is another of our town houses with an indeterminate build date. The name Culverhouse Meadow appears in a will of 1679. A culverhouse being another name for a dovecote. Dove or pigeon houses were a feature of the medieval landscape and were attached to all large manors. A culver was a keeper of pigeons, a bird used to a large extent in cuisine. The house as we see it today likely dates to the early 1850s when the Yarde family moved here and were recorded as 'making improvements'. A house likely existed at the time of the 1807 fire but is not mentioned specifically in fire accounts. From the 1838 Tithe Apportionment we know that the house had a meadow and closes of land and backtracking we can see that those pieces of land were in the ownership of William Stidston Esq in 1811 and 1812. William Stidston died on 13 April 1818 although his will does not mention the Culver name, from the description and the mention of Kate Brook Meadow, we can assume that he held Culver House up until his death. The EFP of 29 April 1819 carried a For Sale advertisement for the house (unnamed) but as ‘late the residence of William Stidston Esq, deceased’. The first recorded occupier using the Culver House name we have is an ex-Naval man, John Milligan Seppings who died at the house in 1826 having bought the house from the 1819 advert. The next owner and occupier of Culver House was a physician, John Harry who lived at the house with his wife Sarah. He was listed in the 1838 Tithe Apportionment as owner/occupier of 25 plots, amongst them Culver House (plot 1704), Garden (1061), Culver Meadow (1062) and Meadow (1063). Extract from the 1838 Tithe map showing Culver House, Garden and Meadow plots outlined in yellow. The Yarde family occupied the house from 1851 to 1909. 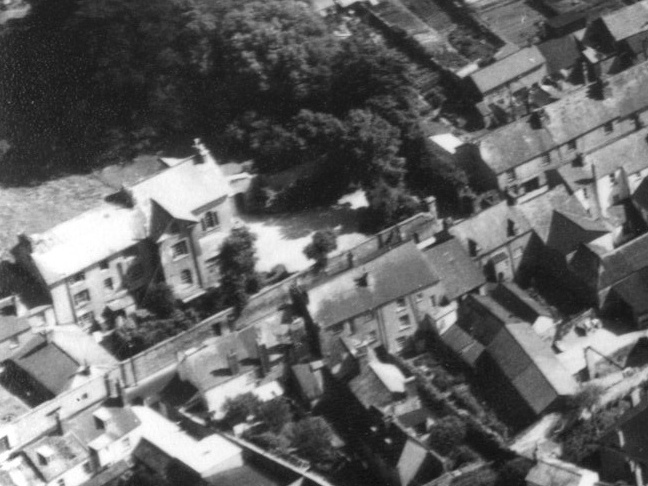 The house was converted to flats in the mid-1930s and the vicarage was also located here in the period 1948–1954. By the 2000s all the flats were empty and by 2015 the building was becoming derelict; athough there had been an attempt to start resoration, the work failed to progess very far. In 2016, the property was sold by auction as three separate lots and by September 2017 the three sections – now reverted from a total of nine flats to three separate houses (Culver House, The School House & The Old Vicarage) – are in the well into the process of being restored, with the exteriors basically complete. The high stone wall fronting the property along New Exeter Street is Grade II listed, but strangely, the house itself is not listed at all. This house is located on the south-east side of Station Hill and known formerly as Tor View, Rock View and Palace Cottage in its earliest form (c1810/20). In 1852 Mary Jones in her Chudleigh History commented that the grand gothic arched entranceway to the former Bishop's Palace was located in what later became the garden of Palace Cottage and that its existence was still in the memory of some of the older inhabitants of the town. To be let for a term of 5 or 7 years, or sold for a term of 15 years with immediate possession, a neat and convenient residence called PALACE COTTAGE. With coach house, stable, garden, offices and extensive and productive orchard thereto adjoining and belonging. Pleasantly situated in the centre of the most admired scenery of Chudleigh and within a few minutes walk of the town. To this house belongs an excellent Pew in the Parish Church. For particulars and to view the premises apply to Messrs Hellyer and Kendall, Solicitors, Chudleigh. By 1838 it was owned by a Thomas Latham. At that date it was in the occupation of Stephen Watts an engineer. With him his wife and four daughters. For a short period in the early 1850s the occupier was Richard Trist, a fundholder. In the 1860s a farmer named Robert Haydon lived here. A spinster by the name of Fanny Prudence had moved in by 1881 and was originally of Tring, Herts. With her a daughter, Emily. Following them by 1901 was James Cleland Moore (born 1826 Ireland) a retired Inspector of Police. he died in 1907 and was buried at Chudleigh Cemetery. His wife Marianne is assumed to have remained at the house until her death in 1922. The house in more recent times was converted to flats but in the 2000s reverted back to a single dwelling. At that time the name became Cypress House. Built 1848 for Col. Christopher Lethbridge who moved within a few years to Rock House in Station Hill. The next occupier was Welshman John Ellis who came to the house in 1856 with his wife Julia and three children, all of whom had been born on Madeira. 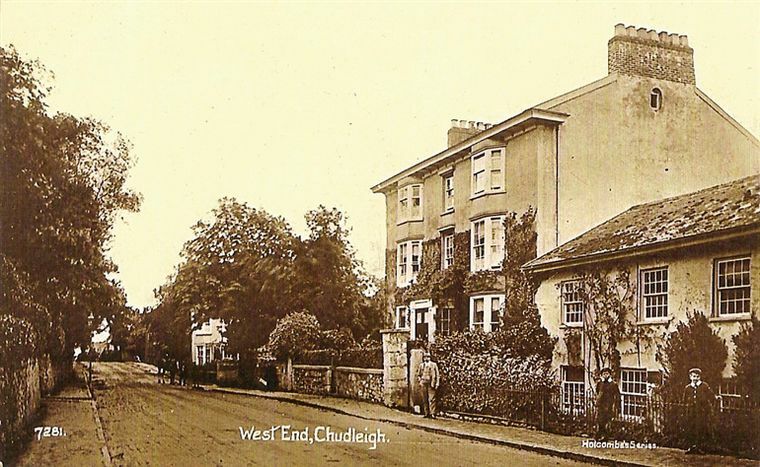 His first child to be born in Chudleigh was Edith Ellis who remained at the house throughout her life, dying there in 1939. Four further children were to be born at the house in the period 1862–1871. John Ellis died at the house in 1883 and his wife in 1905. 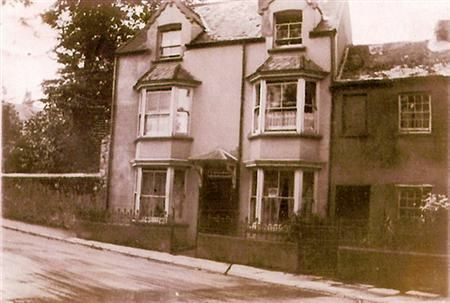 Their unmarried daughter Edith Ellis continued at the house and was joined by her younger brother, Robert Mackay Ellis, a doctor who had returned to Chudleigh by 1910 and who died at the house aged 64 on 15 January 1936. He was interred at the cemetery. With the house empty at the outbreak of the Second World War the building was requisitioned by the military authorities and used for troop accommodation. A static water tank was excavated in the grounds at this time (one of three in the town) for use in case the town was bombed. In 1947, following vacation by the military, Newton Rural Council took over the building and within a year it had been converted into four flats. Formally purchased by the council in 1953 the attached gardens running alongside Colway Lane down to New Exeter Street were then used to build a row of houses. In 1978 the original house was demolished and in its place two blocks of two-storey dwellings were built. Retaining 'The Elms' name a plaque on one of the blocks records their opening by Teignbridge District Council in 1979. Built on the site of Oaklands home farm and named Farmborough no earlier than 1905. Given the name by the then owner a widow, Mrs Caroline Lord (who had moved here from Kerswell). Farmborough near Bath, being the birthplace of her daughter. Mrs Lord had moved away by 1922 and was followed by G N Carleton-Stiff who left in the early 1930s. His replacement, by 1935 was Major Frederick Ernest Koebel who was previously of Harpenden, Hertfordshire. He died on 19 April 1940 and a brief notice in the local newspaper reported that he was formerly of the 51st Sikh's (Frontier Force) Indian Army. The Mid Devon Advertiser of 5 July 1941 reported that Mrs Sylvia Shaw of Farmborough was fined for leaving her car unlocked with the window open whilst shopping in Newton. During the latter war years a Mr Sebbings resided there, he owned a chain of butcher shops in the area. Later ex-RN Capt. Ronald Cunningham Wield CBE and his wife moved here, later moving to Coburg House in the town. Following them were the Edwards family who created a vineyard which has remained here until very recently. The origin of the name may derive from a Holy Well dedicated to St Fili of whom little is known. The name Filleigh also appears in both North Devon and West Devon and at Philleigh, Cornwall. St Fili traditionally had associations with Glastonbury. He was an early saint of the Ancient Kingdom of Dumnonia. Both Buckland Filleigh (near Shebbear, West Devon) and Filleigh (near South Molton) were both in the 14th Century held by Sir Simon de Filleigh, his estate eventually passing into the hands of the Fortescue family. There was a Fortescue in Chudleigh in the 1700s and possibly earlier) so this may be an explanation of how the name came about, although this has yet to be substantiated. The name here existed in records of 1601. The house seen today likely dates to the 1830s although a house was occupied here since at least the 1790s. A long term resident was Evan Baillie who came to the house with his wife in 1869. He was a cattle breeder, particularly favouring shorthorn bulls. The Filleigh Herd was highly thought of and often won prizes at agricultural shows. It was Evan Baillie who gave land at Heathfieldlake Hill on which the Syon Abbey was built in 1887. He died at the house two years later, his wife Louisa continued to reside at the house until her death in 1922. From 1939 to 1958 the house was owned by the Hay family. Purchased by Col Howard George Fitzgerald Hay CBE DL JP it was later farmed by his son Howard Saltau Fitzgerald Hay who was also a motor racing driver. He entered the Le-Mans 24-hour motor race in three consecutive years; 1949 (6th place), 1950 (14th place) and 1951 (22nd place). Formerly called Rock Cottage and was likely originally built as accommodation for the lime burners working in the adjacent quarry. It is said that the house is built over the top of an old lime kiln. 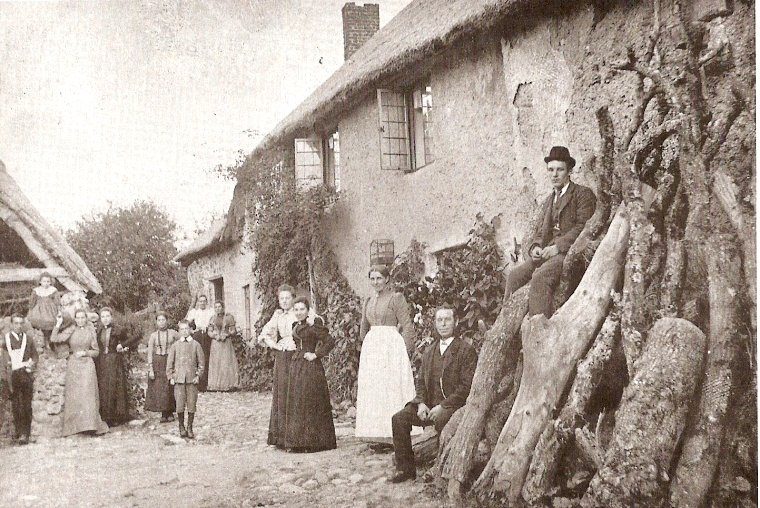 The Glen Cottage name came into use about 1892 and for about the next 25 years was a popular charabanc destination for day trippers who were visiting the famed Chudleigh Rocks. The Kate Brook passes close by and walks through the glen could be had to view the picturesque scenery and waterfalls. 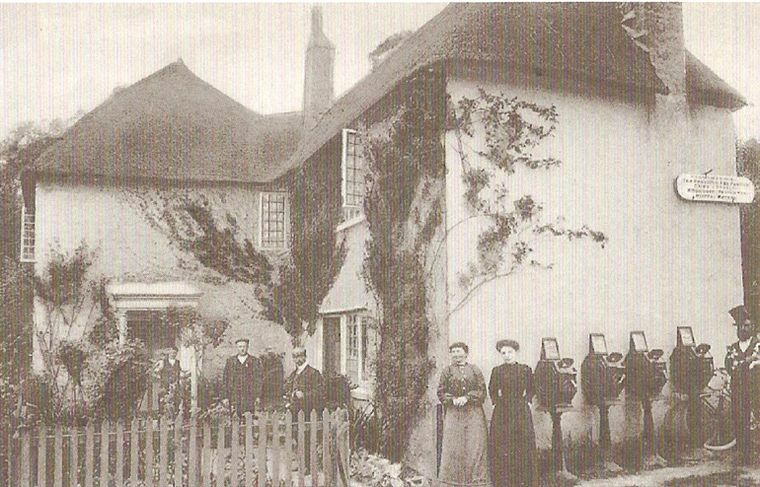 The cottage in about 1908. 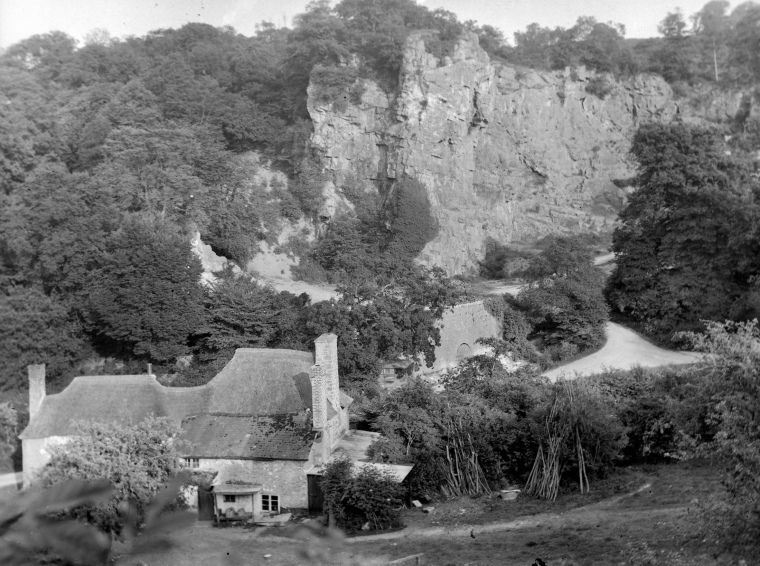 Glenn Cottage from Chudleigh Rock, probably in the 1950's. The Kate Brook runs behind the cottage towards the glen to the right; a lime kilm and the quarry beyond. The house was probably named after General Gordon, killed at Khartoum in 1885. The first occupier was a retired sergeant-major of the Royal Irish Fusiliers so this would seem to be a reasonable assumption. The house is one of two dressed limestone-built houses in the town, the other is the Vicarage in the Parade. To the Glory of God and in memory of Loveday Clack born 6th July 1845 died 20 January 1895. This window is dedicated by her husband James Clack. She was interred in the Chudleigh Cemetery. Barely two years later her husband died, also aged only 49 years. He was buried with his wife and a stone still marks their grave. Built in 1912 as the country retreat for Sir Edward Chaning Wills, Bart. The name Hare Cumbe existed as early as 1249. Sir Chaning Wills was a descendant of the Wills Tobacco Company although he was a surgeon and vehemently opposed to smoking. Harcombe in his day comprised an estate of some 1300 acres. He died in 1921 and is buried in a substantial tomb in a secluded spot on the estate. His wife continued to live at Harcombe until her death in 1953. A year before her death – on 23 June 1952 – an RAF DH100 Vampire F1 jet (TG298) crashed into a field close to the house, flying in formation at 30,000 feet with others from RAF Merryfield, Somerset it is considered that a lack of oxygen caused the pilot to pass out. The pilot, 19 year old Allan Durham lost his life in the crash. He was buried in St Peter's Churchyard, Ilton, Somerset although originally from Swallownest, Sheffield. From 1953 the house was to see a number of private occupiers until the late 1970s when the house was converted to a hotel with twenty-seven chalets built in the grounds. That venture was relatively short lived and the house and 300 acres was taken over by the Fire Services Benevolent Fund in 1981, that facility for rehabilitating firemen continues today. Built about 1830. From about 1848 the residence of William and Ellen Rouse who had moved here from Coburg House. They were instrumental in setting up the Baptist movement in the parish and for many years afterwards the house was the manse for successive Baptist ministers. For a short time around the end of World War Two it was in use as a guest house. In 1987 the house was advertised for sale, a brief description said that the house comprised seven bedrooms, two bathrooms, day rooms, a billiard room and outside a range of outbuildings (including a thatched dog kennel), heated pool and just over 4 acres of land. 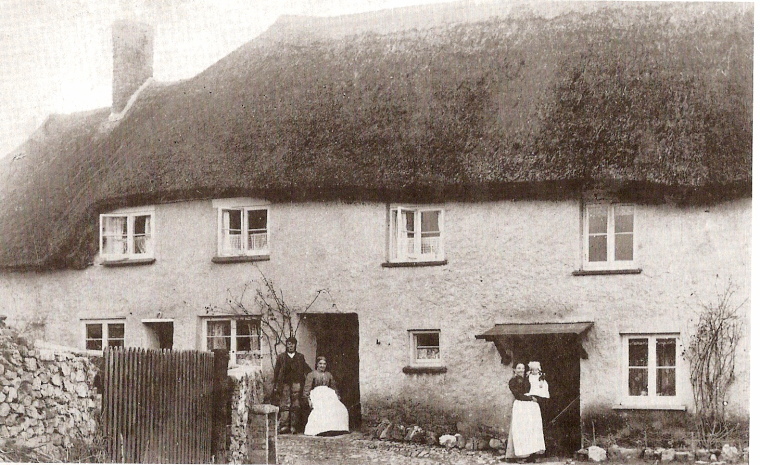 To be LET for a Term, or SOLD by Private Contract, most completely furnished, HEIGHTLEY COTTAGE, situate in a fine sporting Country, on the great Road to Plymouth, about Half a Mile from the Market-Town of Chudleigh, Nine and a Half from Exeter, and Seven from the much-frequented Watering-places of Teignmouth and Dawlish. The House contains Two Drawing-Rooms, Breakfast and Dining Parlours, Four Bed-Chambers, Five spacious Lodging-Rooms for Servants, with all requisite attached and detached Offices, Green house, double Coach-House, Stables, &. near Two Acres of Pleasure-Ground and Shrubbery, Three of Meadow, and One of Courtlage and Kitchen Garden, in a high State of Cultivation. The truly romantic and picturesque Scenery surrounding Heightley is not to be surpassed in the County; there are several capital Packs of Hounds kept in the Neighbourhood. The cottage, pcictured here in 1848, is recorded as being burnt down in 1860. The house seen today was built in the early 1880s and in the occupation of the Moyle family by 1885 who remained at the house until 1949. It was then for a while in use as a retirement home. It has since reverted to a single dwelling. Known as Hurst View until 1990. The first dwelling on the site was built about 1842 and in use as a gardeners cottage until the early 1870s. It stands just to the south of the original vicarage (now called The Glebe House) and on land that was formerly glebe. By 1875 the cottage had been enlarged with part of the building housing the Church Sunday School. By 1881 the first use of the name Hurst View Cottage is noted in the census. A number of tenants occupied the house until the 1920s when purchased by a Mr and Mrs Woodhead, formerly of Exmouth. Mr and Mrs Samuel Rennie came to the house in 1930 from Buckfastleigh. Samuel Rennie died in 1935 and his widow, Mrs E L Rennie continued here until her death at the house, aged 94 years in 1943. The four year period 1942-46 saw the house in the occupation of Mrs Pamela Urquhart (nee Condon) wife of Major General Robert Elliot Urquhart CB DSO, the commander at the heroic but ill-fated Battle of Arnhem who tried to capture a bridge over the Rhine River. His wife Pamela was the granddaughter of Mrs Rennie. In 1958 Urquhart published 'Arnhem: Britain's Infamous Airborne Assault of World War II' detailing his exploits in the battle. He is also the subject of a biography by John Baynes 'Urquhart of Arnhem' , published in 1999. His father-in-law Brigadier William Edmond Hunt Condon OBE had retired here from a life in India in early 1948 with his wife Isola Mary Nelson Condon (nee Wright). The couple remained for the next eleven years until moving to Kingskerswell. This house dates to the mid-1880s and built for a retired banker by the name of Richard Rose (a coincidence but no relation to the Richard Rose who ran the Kings Arms at the time of the 1807 fire). A police superintendent by the name of C Elton Cary was in residence shortly following the first war. He was probably a tenant of Mr Arthur and Sophia Ann Whitburn Tanner, the latter the niece of Richard Rose who it seems retained ownership of the house until her death in 1944. In the 1970s the house was owned by local television personality Moira Babington who was popular for her programme 'West Country Cooking'. The name is an ancient one although the house seen today likely dates to a build of no earlier than 1870. In July 1806 a newspaper item said the school was to close and relocate to Bath. In the April of 1794 Rev John Swete of Oxton in Kenton parish passed through Chudleigh having come from the Teign Valley and over the former Chudleigh Bridge (demolished 1816). Passing Bridge Mills he entered through the lower Lawell gate, presumably near Heightley Bridge. Of the scenery he was highly impressed and of the estate he said it was once the property of the family of Eastchurch but from them passed to Shepherd, a Sergeant-at-Law. By him the present edifice was erected in front of the old Eastchurch mansion, passing to his son on his death. He went on to say that the estate was purchased by Lord Clifford 'about thirty years ago' and by its acquisition was able to extend his park and re-route a public road to a more commodious distance. Of the Shepherd mansion he commented it was large and built of 'marbly stratum of the spot' but had little elegance. By the 1820s it appears the house was left to fall into decay and was not used again as a residence until the 1870s. By 1875 Mary Jones commented that it was a 'restored and commodious villa'. Formerly called Lawn Cottage and dates to about 1810/14. It is said that Napoleonic prisoners of war laid the cobbles on the veranda. Until 1953 the house was in the ownership of the Clifford family. From 1939 to 1947 the house was in the occupation of a distinguished resident, Sir George Frederick Hammick, Bart. the eldest son of Vice Admiral Robert Frederick Hammick and Grace Caroline Hammick. 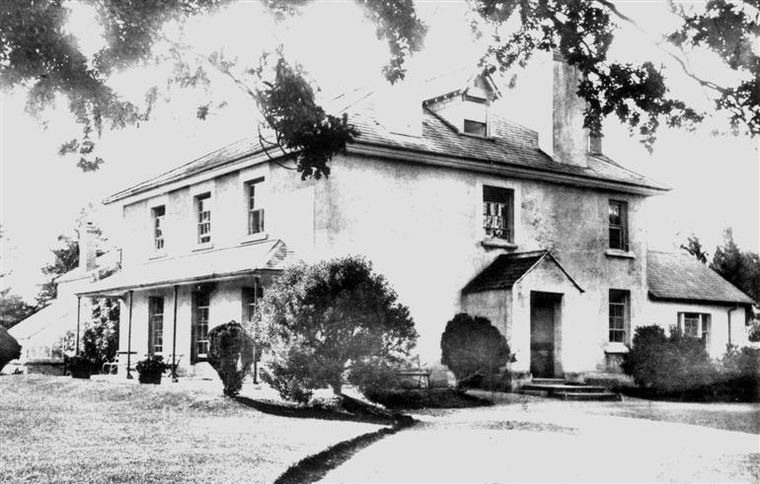 When in Chudleigh the Hammick's played a major role in many of the local organisations, right through the war years and the extensive lawn of the house was often used for fetes or Empire Day celebrations for the schoolchildren. Sir George was a member of the Pynsent Charity a position he resigned from in October 1947. He died in Honiton in 1964. Formerly called James House until 2017, before 1994 it was known as Littlehill House. The house dates to early 1840s. Renowned 19th Century British falconer who helped rekindle interest in the ancient art of falconry through his teaching of others, his co-authoring with F(rancis) H(enry) Salvin of the classic work 'Falconry in the British Isles' and his exquisite paintings of hawking and raptor subjects. Given with respect by his sporting compatriots in North America. As James House, the house was converted to use as a small mental health hospital in 2008. Renamed Meadow Lodge in Apri or May 2017, the service is currently run by Huntercombe (Granby One) Limited. The house was originally called New House to 1865, then Newington Lodge to 1875, Scotleigh to 1958 then Newinnton Lodge to the present day. The EFP of 11 September 1806 carried a for sale advertisement stating that the occupier, Mr Batt, was moving to reside at Lawell. In his Chudleigh, A Chronicle , Anthony Crockett suggests (with no real evidence) that Mark Batt – Charles Lord Clifford’s land agent – was residing at Taverners, later known as The Retreat. However the EFP description could well also suit New House (now Newinnton Lodge). At the top of Old Exeter Street (close to Little Silver) was a detached property owned by Christopher Hellyer (attorney) and as Batt had come to Chudleigh as junior partner to Hellyer it is likely to have been the house shown on the Tithe Map near Little Silver and tentatively identified as Taveners. We know from various EFP notices that Richard Rose, whose coaching inn, The Kings Arms (Town Hall site), had burnt out in the Great Fire of 1807 and was given the use of Christopher Hellyer’s house which he used until the latter part of 1808. The Basic Rate List for 1810 gives the name Mary Bidgood for Taverners and other property. Mary, born in 1740 was the widow of William Bidgood ‘Mariner of Chudeigh’ who had died in 1802. Mary died in 1822 and they are buried together in the churchyard close to the northeast corner of the church. The EFP of 12 June 1834 carries a ‘For Sale’ advertisement for a property on the High Road from Chudleigh to Exeter and by the description could well refer to the detached freehold house that was to be purchased by the retired Vice-Admiral Sir William Isaac Scott RN (1779–1861) in 1834/35 and throughout his occupation called New House. The adjacent Boyer Hole Meadow was part of his estate. Scott’s wife Elizabeth died at the house in October 1840 and Sir William twenty-one years later on 12 January 1861. At the 1861 Census date, the house (still as New House) was in the occupation of his widowed daughter-in-law Frances E. Scott (51) described as clergyman’s widow, along with her three daughters; Frances E. (19), Mary K. (17) and Charlotte M. (10). Frances Scott left the house around 1861 and her brother, William Bower let the house to a succession of retired ex-military gentlemen. By 1866 the house was in the occupation of General John Blaxland and his wife Ann. He was the son of Christopher Blaxland of Kent (1770–1812) whose estate there was called Newington, hence the house name-change to Newington Lodge. In 1866 William Bower Scott donated Boyer Hole Meadow to the parish for the building of a reservoir; the site can still be seen on the left side of the entrance to Highlands Park, most of which was built on the remainder of the plot. The 1871 Census has John and Ann Pyke Blaxland at Newington Lodge. In 1878 the house was in the occupation of a General Maister and the name had changed to Scotleigh about the same date, no doubt as a memorial to Vice Admiral Scott; certainly by 1880 the house was known by that new name. The 1881 Census shows occupation by Robert G. Lord (60), wife Annie (40) and four sons. From 1886–1891 the house was home to Dr Charles Henry Wade who stayed for about ten years, leaving not long after the 1891 Census when he was at the house with his wife Mary and their two daughters, Minnie and Georgetta. It was during his time there that the first two telephones were set up in the town (November 1886), one being installed at Scotleigh which linked him with his colleague Dr George William Lillies at Fore Street, in the house that is now Alpha House. 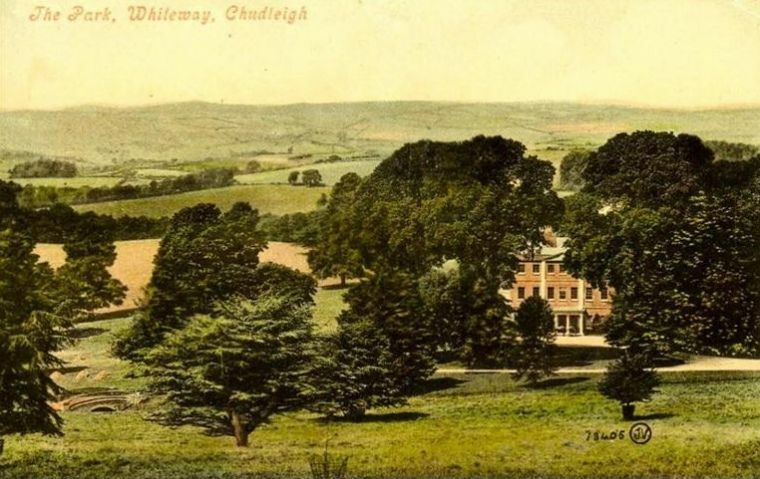 The lawns were often used for fêtes and one such occasion occurred in May 1885 when an event was arranged to mark the twenty-fifth anniversary of the Chudleigh Volunteers. The 1893 town directory has a Mrs Scott in residence. By 1902 the town directory lists a Mrs Dawson along with the Misses Hare. The 1901 Census shows a widow, Catherine R. Dawson (60). Mrs Dawson continued until no later than 1914. In 1919 the house was in the occupation of Capt. Charles Henry Cardozo (late 8th Batt, The Buffs); he was followed by two further retired military men, Lt-Col Thomas Charles Bedford Holland (1923) and Col George Browse DSO MD (1926–30). In 1935 Mr John Patrick Hepburn JP moved in with his wife Mrs Rose Marion Scott. His family retained it through the war years and up until the close of 1957 when the family moved to Torquay. The 1951 Voter List shows John and Rose Hepburn living at Scotleigh. 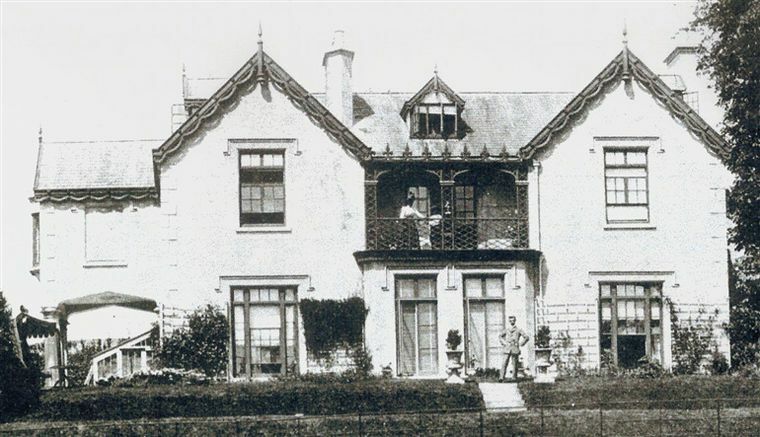 In the period 1958–1994 Edward and Lettice Hadow lived in theh house; disliking the name Scotleigh, they reverted the name (incorrectly) back to Newinnton Lodge which they believed from the Hepburn’s that had derived from New Inn that formerly stood close by. From 1994 to 2009 the Summerfield family owned Newinnton Lodge, running a small electronics business. In 2012 the house reverted to residential use. Formerly called Orizava Cottage and built about 1834 for RN Commander John Powney. Dr Halle in his Letters, Historical and Botanical (1851) explained that the original house name 'Orizaville' came about when 'a service of plate was given to Commander Powney by Mexicans who resided in sight of the mountain.' The mountain formerly called Orizava is today Orizaba. It is Mexico's highest mountain at 5612m (18,404ft). Of Commander Powney, of whom he was acquainted Halle said 'he was a gentleman of rare nobleness and spirit, and of knightly courtesy'. The house was purchased by the Oldham family who had most recently lived at Bournemouth. It was Mr Joseph Oldham who changed the name to Oakfield. The house remained in the ownership of the Oldham family until the Second World War. Major William Flickes Milles of Filleigh is listed as owner and occupier of the Filleigh estate which totalled over 115 acres. He had come to Chudleigh in 1837. 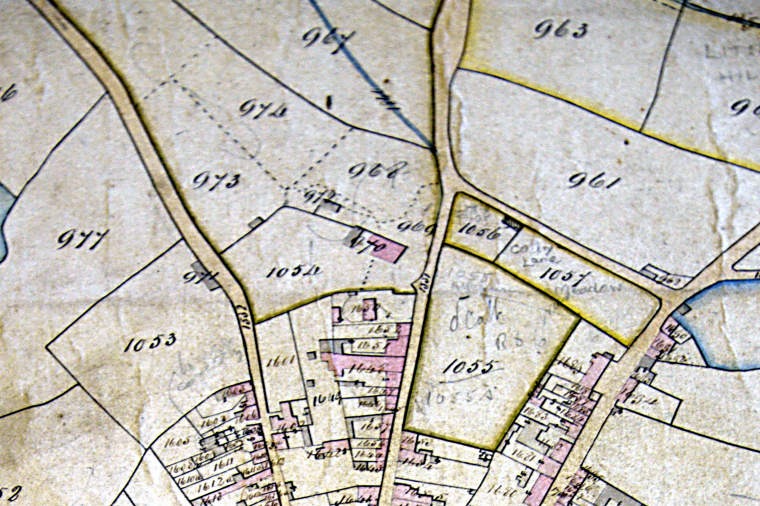 Oaklands is not shown on the 1838 Tithe Map nor is it listed in the 1841 census. However we know that Thomas Veale Lane takes up occupation of newly built Oakfield in early 1842. He was originally of Brixton, Devon (born 1809) the family being long-established at that place. He had four daughters, the eldest being Julia Lucy born in Munich in 1837. Their second daughter Melissa (born c1838) died in infancy at Naples, Italy in 1839. The third daughter was Georgiana Harriet (born 1840 Brixton). The third child of Thomas and his wife Juliana (nee Pellew), Louisa Emily, was born at Oaklands in 1842 and baptised at Chudleigh Church. The 1851 Census has Thomas Veale Lane in residence at Oaklands with his wife, three daughters and four servants. He was described as a farmer of 80 acres. At the census date he was employing three men and one boy. The family moved away and evenutally Thomas and Juliana settled in Leamington, Warwickshire. In 1867, the EFP carried a 'For Sale' advertisement (18 December) for the house and we know the purchaser was Major General Charles James Buchanan Riddell CB RA and his wife Mary Buchanan Riddell. She died at the house in 1900 and he in 1903, they have a grave in the cemetery. Major Riddell was very active in the community and as a member of the local Sanitary Committee took a very close interest in the Chudleigh water supplies. In January 1904 the Oaklands estate was disposed of to Mr Frederick Bailey Lord of nearby Kerswell Rock. He was a tutor of foreign pupils (1901 census, aged 60) and was a breeder of Beagles. He was originally of Tooting, London. His wife was Caroline, originally of Bideford. His daughter Miss Edith Lord ran the Chudleigh School of Lace. By 1906 St Joseph's Ursuline Roman Catholic Convent was occupying the house and remained until the autumn of 1922. A small school for girls was also run at the convent by the nuns. A sale catalogue is held at the Devon Record Office for the house dated 1923. A sale advertisement (Chudleigh clippings file at Chudleigh Library) states the auction was to take place at the Globe Hotel, Newton Abbot on 10th January 1923. The house had, until recently and for many years past, been used as an Ursuline Convent and is eminently suitable for a school or similar institution, occupying a sheltered and healthy position. Containing thirty-five to forty rooms with central heating, electric light and ample water supply. In the grounds a detached ten-room house also two cottages, fernery, lawn, kitchen gardens, flower gardens, shrubberies, plantations, orchards and pasture land. The whole extending to 26 acres 0 roods and 21 poles. By 1926 the house was in the occupation of Mr Herman Joseph Cramer who had previously been living in the Chudleigh hamlet of Kerswell (1919–1923). He renamed the house Westwoods and stayed until the early death of his wife Tilly at age 45 in 1932. Herman was born in British Honduras (Belize) in 1874 and had married Tilly in London in 1905. Following his wife's death he moved away to Brockenhurst,Hampshire but on his death in 1947 was interred with his wife at Chudleigh Cemetery. By 1935 the next occupier was Mr Hugh Pearce-Gould, a solicitor and attorney who was still in residence four years later. he was to live out his latter years in London. In 1953 Westwoods was in the occupation of Mr and Mrs Edward Pearson Mills, he being a farmer and cattle dealer. On 8 June 1957 Westwoods was advertised for sale. Described as a late regency house, farming property, twenty-three acres and various outbuildings. Public auction at Rougemont Hotel, Exeter 12 July 1957. Just prior to the sale the London Gazette noted his bankruptcy. After a short time at Whitstone Farm, Bovey Tracey he moved to live in Anglesea, North Wales. Formerly called Pear Tree Villa and before that Fair Park Cottage. A house with a very long history that has yet to be finalised. It may have also been called West Indies House in the late 1700s. Very Desirable Premises – to be sold in Fee by the order of the Assignees of the Estate and Effects of Mr John Weston, in five lots. Lot 1, an excellent dwelling house, spacious kitchen, beer cellar, pantry, scullery, and other offices underground; four parlours on the ground floor, a drawing room, on the first floor; five bedrooms, on the second floor; and two attics; together with a pump of excellent water, and two gardens adjoining. Lot 2, a very valuable watered meadow, immediately behind the dwelling house, containing about four acres, also in the possession of Captain Pellew. Lot 3, a cottage in the occupation of Thomas Shapter, as yearly tenant. Lot 4, another cottage in the occupation of John Madge, yearly tenant. Lot 5, all that spacious yard with the coach-house, lofts, sheds, stables and granary therein in the possession of Capt. Pellew, and Messrs Weston, Clench and Pullen. The purchaser of each lot will be entitled to vote for Members of Parliament for the county. The auction to take place at the Clifford Arms Inn on Monday 30th June at 3 o'clock in the afternoon. 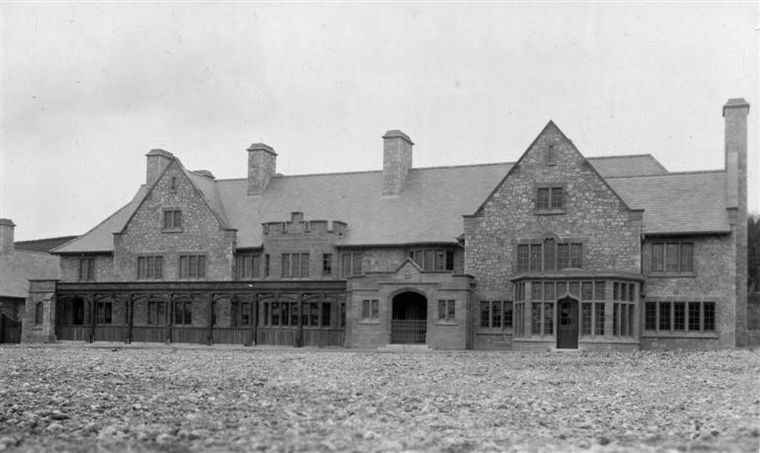 Just short of 100 years later, on Friday 22 April 1927 the house in its nearly two acres of grounds was auctioned at the Rougement Hotel in Exeter. It was described as a charming old fashioned stone built residence of about 200 years old. It comprised an entrance hall, 3 reception rooms, 7 or 8 bed and dressing rooms, bathroom (h & c), cloak room (h & c) and the usual offices. With ample outbuildings, garage and excellent cottage which contained a living room, kitchen, 2 bed rooms and a bath room. With beautiful grounds, together with a walled kitchen garden. The cottage referred to in the advertisement was the converted coach house that during WW2 was used for parish council business due to the Town Hall having been taken over by the military authorities. An Impressive Detached Residence in the heart of Chudleigh. Dated back to late 1700's, this listed building has a lot of accommodation on offer. Large Gardens surround it and there is an annexe attached. 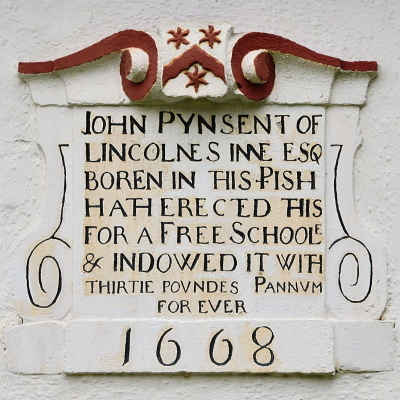 Built in 1668 for John Pynsent's Free School, later named The Grammar School, the Pynsent coat of arms may be seen on the front of the building. The school closed in 1914 and it has since been in use as a private residence although it should be noted that the current owner offers bed & breakfast accommodation in what is a very historic building. 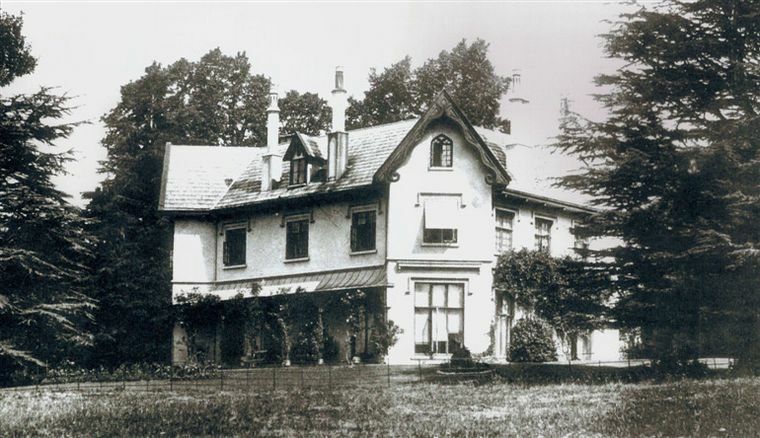 The house photographed in the 1950s. Note the pot water dipping pit in the boundary wall. This section of wall and the dipping pit were demolished in 1966 to create an opening for vehicular access. This cottage, on the west side of Station Hill was built sometime in the period 1841–1851 alongside the ancient animal pound. By 1902 the cottage was in the ownership of Miss Anne Winter who gifted it to the parish not long afterward. Since its build, only three families had occupied it, their names being Westaway, Bickley and Cannon. The SDWE of 23 November 1904 reported that 'no one has yet made application for the house lately done up and presented to the town by Miss Winter, on the Station Road. It has been placed under the management of the Charity Governors. That body has issued a notice asking for old couples to give in their names, but no response has come. The house is large enough for two old couples and is offered rent free'. 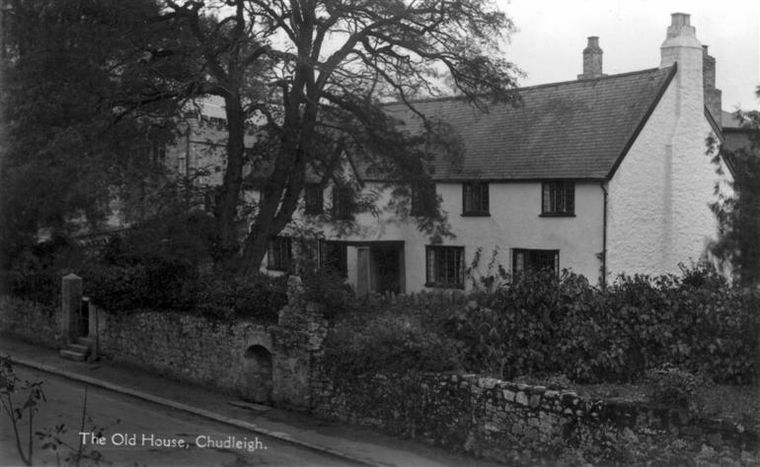 As the Chudleigh Almshouse it remained for that purpose until 1927. On 17 September the MDA reported the sale held at the Town Hall. The two semi-detached cottages known as the Chudleigh Almshouses, formerly one house together with the Pound have been sold to Miss James of Fairfield, Parade, Chudleigh. It went on to say that Miss James also took the Pound for a previously agreed price. Miss James lived at the cottage until her death in 1953 and it was she who gave it the name 'The Old Pound Cottage'. The cottage continues as a private residence today. A few years ago a new house was built close by the rear of the cottage and given the name 'New Pound'. The house as seen today dates to no earlier than 1846/47. On 6 September 1849 the EFP carried a to let notice for the 'most delightful villa residence ROCK HOUSE'. 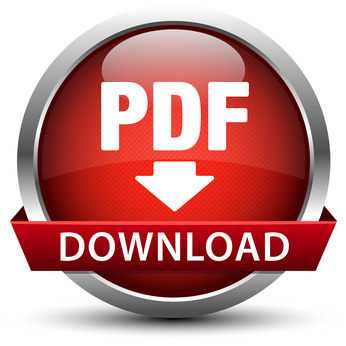 The notice stated that the house was available immediately and replete with new and excellent furniture. Described as having a paddock and garden, detached coach house and stabling and about five minutes walk from the town and church. The house comprised, on the ground floor, entrance hall, dining, drawing and breakfast rooms, water closet, kitchens, and all suitable offices. On the first floor four best bedrooms, two dressing rooms and water closet with servants apartments on the second floor. The most beautifully diversified and extensive views in Devonshire (including Hay-Tor on Dartmoor, Ugbrooke Park, Bovey Heathfield etc) are commanded from the windows and the River Teign, affording excellent salmon and trout fishing, flows within half a mile. The house was at some point in the early years of WW2 commandeered by the War Office and by 1943 in the occupation of American troops. The extensive grounds were by then in use as a market garden, overseen by Mr Jimmy Webber, the school headmaster who put older schoolboys to work there in the afternoons. In 1946 Mr Kenneth Boulton, a trained horticulturalist and recently demobbed from the RAF purchased the house and lived there with his wife Doreen. The house, previous to the war had been in use as a hotel and was converted to flats in 1958 and the market garden became a fledgling nursery under Doreen Boulton's care. Their son Bruce joined the business on leaving school, the grounds were cleared and the nursery improved and in 1987 the Rock Gardens first opened to the public. The nursery, cafe and grounds closed to visitors in 2016. Built for Capt. 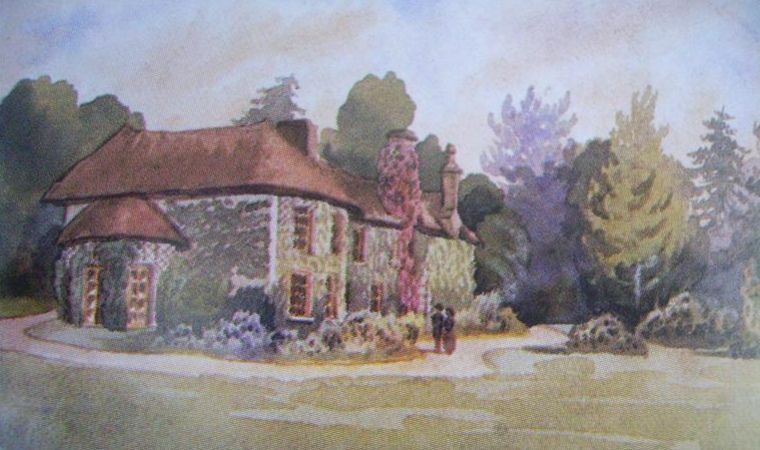 Beauchamp Kerr in 1837, he stayed for eight years. Sir David Dunn then moved in and died at the house in 1859. Members of the Ellicombe family owned the house from 1866 through to 1952. Not long afterward a boarding school was opened that ran successfully until closure in 1989. 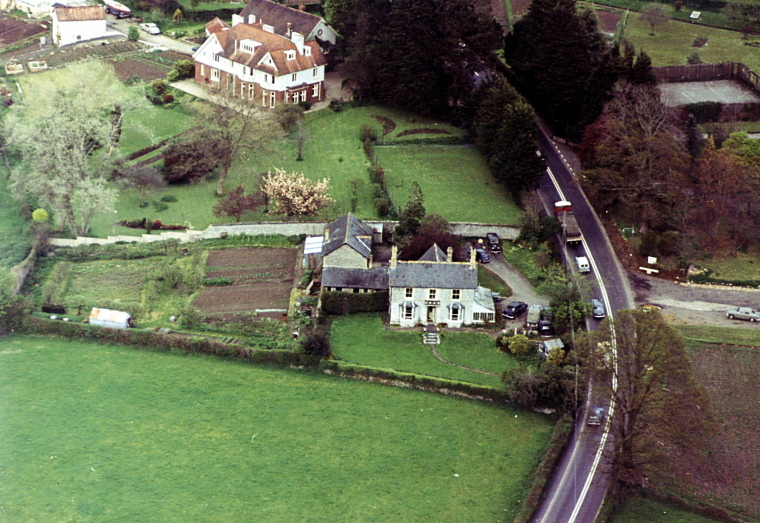 The house was demolished in the early 1990s and the site is now a residential development of nine houses. The Rocklands name was retained for the new houses. The establishment known today as the Highwayman's Haunt Inn was converted from a farmhouse known as Rowells in 1957. Located a mile north of Chudleigh on the Exeter road, a dwelling has stood on this site since Saxon times. Evidence of ancient semi-fortified walls were found to the west of the property which would have enclosed the well at the inns' entrance which was discovered in 1974. In former times the road passing the dwelling was just a by-way called Hockmore’s Lane running from Culver Lane in Chudleigh via Crammers Cross and Harcombe hamlet to Haldon. This lane became a new main route into Chudleigh when a road was built from Kennford via the racecourse and Harcombe. 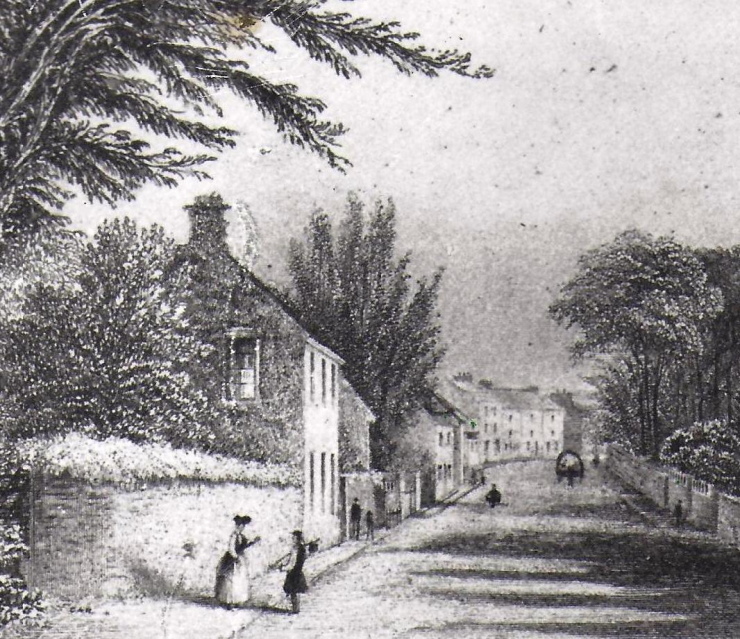 The road was improved in the early 1820s and became the main turnpike route to and from Exeter in 1822. It was designated the A38 in the 1950s and on the opening of the Chudleigh by-pass in 1973 downgraded to B-road status (B3344). Rowells is said to have its origins at the time of Plantagenet King Edward I (1239–1307) and was formerly known as Rowhill – Saxon for ‘rough hill’. It has been suggested that it was likely a building of some importance in the C14. The Grade II listing suggests the property paid a hearth tax of 9s 4d in 1333. The year before, in the 1332 Lay Subsidy, is listed a Ralph de Rowehill. 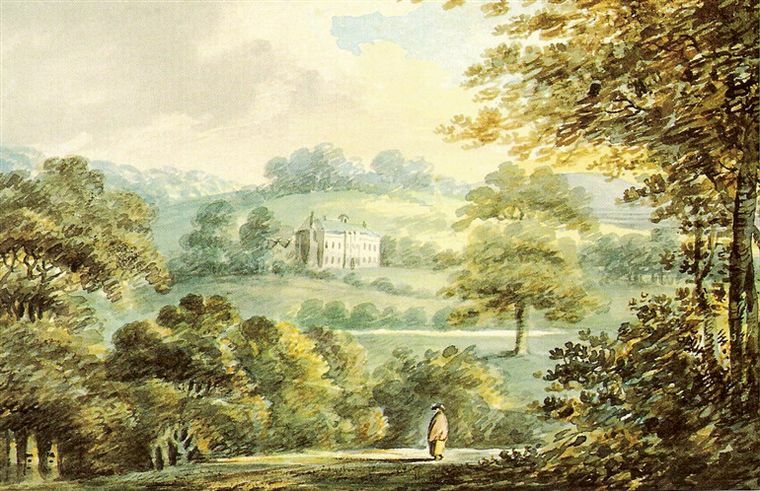 In the C17 Rowells is known to have been part of the Ham’s estate, then owned by Thomas Hunt Esq. and probably remained as part of that estate when the ownership of Ham’s passed through various owners ending with Lord Clifford who sold the estate in 1936. In 1645 it was said to have been used as a Cromwellian headquarters when General Fairfax was at Hams. Probably in the early 1800s it was split into three cottages for agricultural labouring families no doubt working on either of the nearby farms. By 1923 the building appears in directories as Rowell’s Farm and presumably remained so until 1957 when the use changed to that of restaurant. This building type would probably have been all single-storey in its original state, built of cob or dry-stone and dating back to the C11 or C12. The building seen today is likely of C16 and C17 origin with C20 additions. If this building started as single-storey throughout then the house end was later ‘raised’ by an additional floor, a fairly common change that can be seen in any number of properties of this type. Internally the house end incorporated a cross-passage, which no longer exists, with a hall on the right and two domestic rooms to the left. The fireplace of inglenook type, incorporating a built-in clay oven usually tended to back on to the cross-passage. The staircase was often built into the space between the fireplace and the side wall. Today the main part still retains low beams, oak screens (with parts of a plank and muntin screen surviving) and open fireplaces, one of which, the inglenook incorporates the clay oven. A chimney with a brick shaft is located on the right end gable and there are two further axial stacks both with brick shafts. One of these chimneys would have heated the original inner room, and the other, right hand one, the hall. John Flood (51) Labourer (born Bovey Tracey). It seems that John Flood was at Rowells from at least 1839 and potentially through to his death in 1885 by which time his daughter Sarah Jane was living next door with husband John Cobley (see below). Sarah had been born at Rowell around 1840 (census records are ambiguous; her recorded age was 23 at the 1861 census [b.1838] and 49 at 1842 [b.1842]) In 1861, she was working as a housemaid to the widow Hill and her two daughters at Wood House, Hennock. At the time of the c1888 photograph (below), one of the families was named Cobley. John Cobley was born in December 1840 of John & Mary, at Bramble, Ashton (Trusham parish) and by 1861 (age 20) he was living with Mr & Mrs Call at Honeywell Farm in Kingsteignton, when he is described as a carter. He came to Chudleigh parish in 1874 from Exminster with his wife Sarah Jane (daughter of the above John Flood) whom he had married at Ashton on 9 December 1869. The two eldest children – Mary (b.1870) and Sidney (b.1872) – were born in St.Thomas and Exminster, respectively and a further four – Annie (b.1874), Frank (b.1876), Ellen (b.1878) and John (b.1881) – at Chudleigh by the time of the 1881 census when the family were at Warren Cottages out toward Sticksend. By 1891 the family – now including Lewis (b.1883) and Bessie (b.1886) – were recorded at Rowell Cottage, one of three households there, the other two headed by William Clinnick (60) and James Leader (57) both agricultural labourers. John Cobley is shown as a woodman, aged 50 on that census, with Mary (then 21 years old) absent, presumably working and living away from Chudleigh. He was still at Rowells at the time of the 1911 census aged 70. He seems to have left Rowells sometime in period to 1922. He died in Chudleigh on 3January 1929, aged 88 years; there is no record of him in the Chudleigh burial records, so he may have been buried with relatives back in Ashton or Trusham. 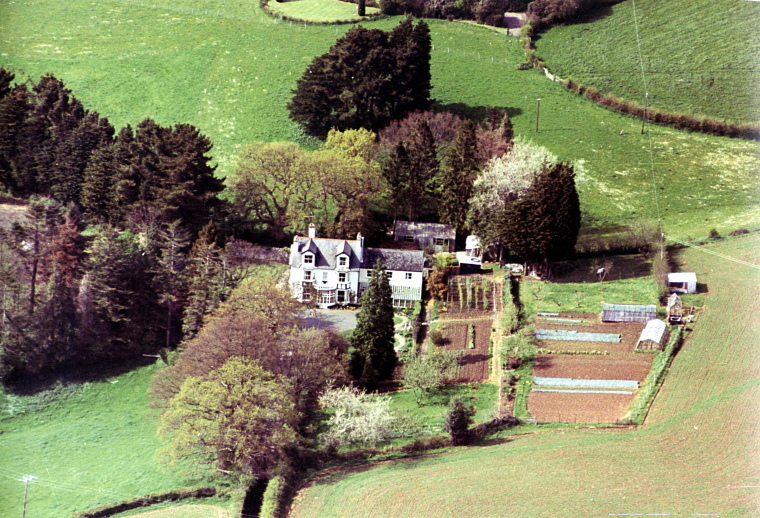 In 1936, as part of a large sell-off of Clifford-owned farming property, Rowells Farm was offered for sale. Comprising 8 acres 5 roods and 3 poles the purchaser was ‘Mr Wilcocks and others’. The ‘others’ was a Mr Richards. Mr William Willcocks was formerly the tenant farmer and had been so since 1923; the farm is not listed as such prior to 1923. The property was later bought by Mr Herbert Alan Black and converted to a restaurant called the Highwayman's Haunt in 1957, since when it has variously been described as a public house, restaurant or inn/restaurant. Former names were Elm Grove, Whitsley House and Giddea House. The house existed at the time of the fire (1807) and likely much earlier although evidence is scant. It was the home of Chudleigh benefactor John Williams from 1841–1869. A sale notice of 1899 gave a useful description – the ground floor was then described as having an entrance hall, dining room (21ft x 19ft) a drawing room (about 20ft square) a breakfast room of similar dimensions, a morning room, a waiting room, two good kitchens and convenient offices and cellars and three WCs. On the first floor there were then seven bed and dressing rooms, fitted bath room and two WCs. The advertisement then reveals that at some point the house had been raised to create a further floor as there was then described the second floor with five bed and dressing rooms followed by the top floor with two good attics and lumber loft. Outside the one and a quarter acres of grounds contained a tennis lawn, pleasure garden, a good walled garden, with water running through (this would have been the pot water leat that also fed a grotto close to the south boundary wall), a wash-house, vinery with cucumber house and on the Fore Street side, a shrubbery, stabling for two horses, two carriage houses with harness room and other offices. In 1946 the house became a residential hotel for a while and then converted into five self-contained flats. The house was renovated in early 2000 and converted into three distinct parts, named Forbes House, Swanston House and Hamilton House. Further detached houses were built in the grounds. The original dwelling on the site was established about 1282 for the Precentor of Exeter Cathedral. Passed out of church hands in 1540, held by Courtenay family (of Powderham) 1550 until 1605 and thence to the Clifford family whose descendants still reside there today. The house and grounds are open to the public at certain times. See the Ugbrooke House website for the full history, etc. A Georgian house of three storeys at the junction of Fore Street and Oldway that from about 1834 to the latter 1890s was home to solicitor Charles Langley and family. An estate of some extent at the time of the Domesday Survey (1086). The name then was Witewei. In 1234 (Book of Fees) is recorded the family name of Whiteweye, no doubt taken from their place of residence.In 1540 a daughter of William Whiteway married Richard Bennett and so the estate passed into Bennett hands until 1722. 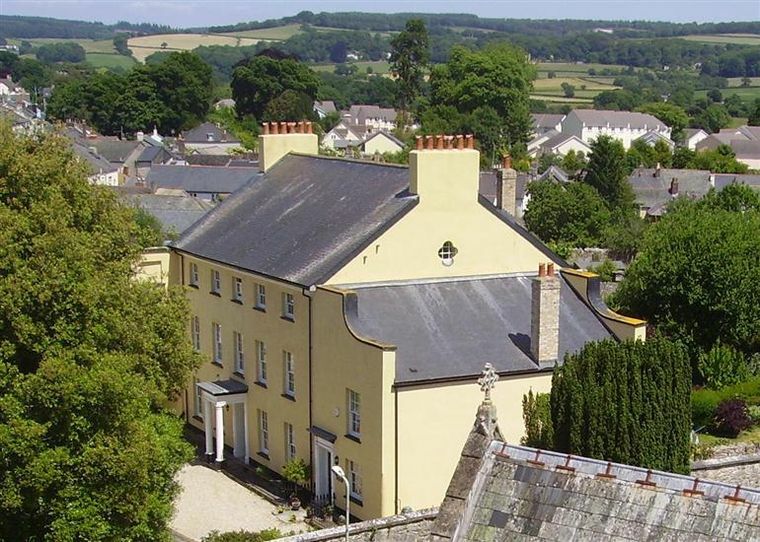 In 1722 the estate was purchased by George Parker of Boringdon, Plympton, Devon. 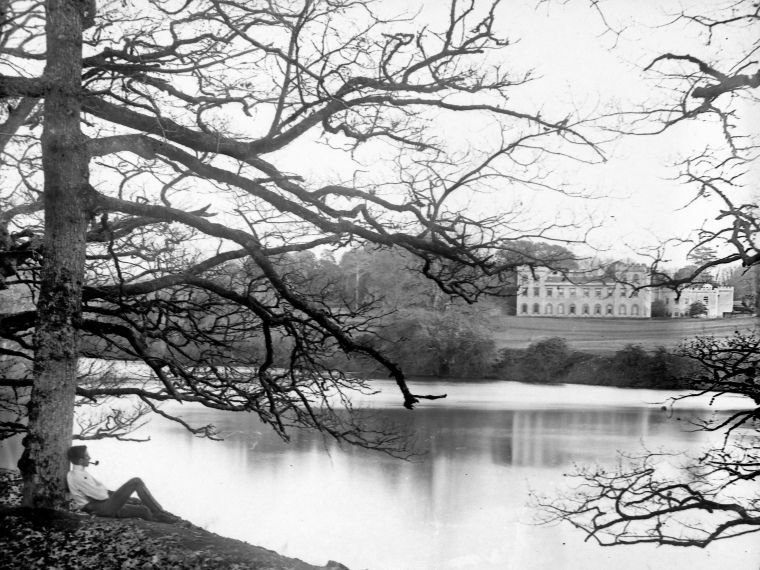 Ten years earlier he had purchased the Saltram Estate (now property of the National Trust). The present house replaced an earlier dwelling on the site that was said to have been 'little more than a farmhouse'. Construction began in the mid 1760s by George's grandson John Parker (1735-1788) 1st Baron Boringdon of Boringdon who soon exchanged the Whiteway Estate for other lands with his younger brother, Montague Edmund Parker (1737–1813). The Parker name was to be connected with Whiteway until 1923 at which time it passed to the Farquhar family. 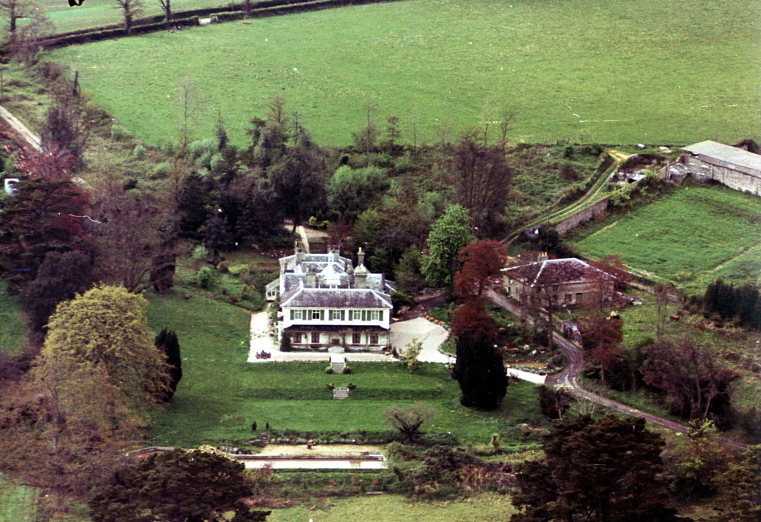 In the Farquhars time the estate comprised over 1000 acres and 800 acres of woodland on Haldon Moor, the Farquhars remained up until 1967 when the house and estate was sold. A postcard view of about 1900 looking north-west. The Haldon Hills in the distance. The next 32 year period (1967–1999) saw 4 ownership changes culminating with the purchase in 2000 by The Rt Hon. The Dowager Countess Spencer and her son, the 10th Earl of Dartmouth.